Planning new construction or an upgrade of your mechanical systems? This one’s for you. I’ll get right to the point: make sure your contractors include mechanical insulation in their plans, designs and specs! For new construction, mechanical insulation contractors are typically subcontractors to a mechanical contractor. They also work with plumbing, heating, and air conditioning contractors. When you hire an architects and engineers to design the building, draw plans, and write specifications, mechanical insulation needs to be included, especially if energy efficiency is important to your bottom line. The specifications should state what materials are acceptable, what methods are to be used in construction, and how insulation is to be installed and finished. Why is it important to include insulation in the beginning? Your contractors will provide estimates and load calculations based on the expected performance of the systems they’ll be installing that will help account for how much you can expect to pay in energy costs. By including insulation in those calculations, you will see the savings right away. 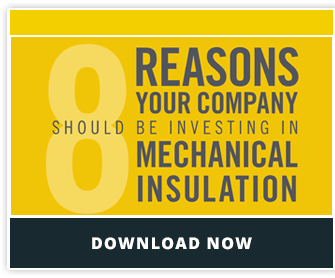 Another benefit to including insulation in your initial mechanical contract is that the costs are upfront, not something you will need to budget for later. Your mechanical contractors should provide you with an estimate that includes the cost of the insulation. When insulation is included in the planning stages of construction, it ensures that everything gets done correctly from the start. The insulation contractor submits his plans and materials to the architect or engineer for approval, so there is a process in place to make sure that all of the proposed methods and materials will work correctly for the building. An insulation contractor and his crew working on your jobsite will also be cooperating directly with your contractor’s superintendent or foreman. There are a series of checks and balances in place to ensure that nothing gets overlooked throughout the process. Remember, the initial cost of construction for new building accounts for only a small percentage of the total cost of the building throughout its lifecycle. Mechanical insulation can help significantly reduce energy costs throughout the life of your building. Make sure that in any new construction plans or facility upgrades, insulation is included so that you can start seeing the benefits right away.